Please note, that Nassi-Shneiderman (NS) diagrams are designed to be free of any syntax. That means you may put arbitrary descriptive text into the elements. It depends on the level of detail, of course, how much sense that makes. Often it is more practical to use more formal notations like pseudo code or even more or less commonly accepted programming language constructs. 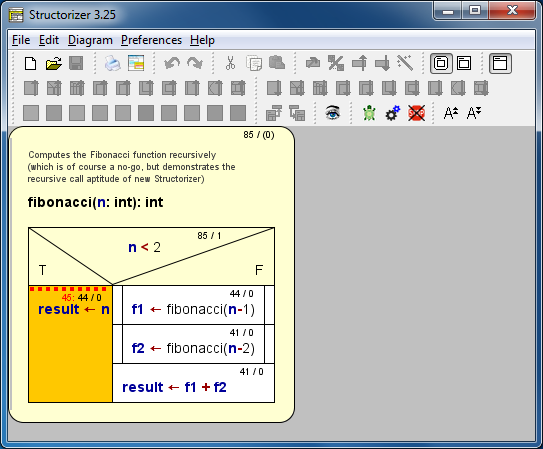 In order to "execute" an NS diagram, however, you have to stick to some kind of syntax. For the same reason, not all diagrams nor all contained structures can be interpreted. The executor has been added to allow beginners to easily catch and understand control structures and execution flows. Over the time, however, several enhancements and accomplishments have made it a lot mightier than originally planned. 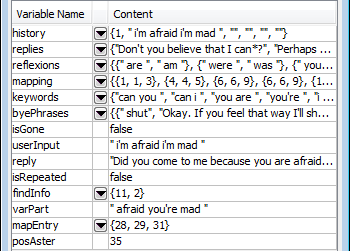 You find an overview of the executable dialect used in Structorizer on the Syntax page of this user guide. If your algorithm contains Turtleizer-specific subroutines, however, then you must click on the Turtle icon in the toolbar or select the menu item "Debug => Turtleizer ..." instead (unless the Turtleizer window is already open): . Note: You cannot close the control panel by the operating-system-typical close button (e.g. the top-right red 'X' in Windows, see image above, or the red traffic-light button in OS-X) while an execution is running or pending. Since release 3.27 you will be warned if you try. The control panel will automatically close on execution termination (unless Runtime Analysis is active), thus also on pressing the button. You may iconize the control panel in the usual way, though. When having pressed one of the buttons or , the Executor Control panel will pop up (see the figure near the top of this page). Here its details will be described. (Stop): Aborts execution immediately and closes the control window (unless Runtime Analysis is active), all execution status will be lost (tracked runtime counts will survive, though). (Run): Starts or resumes execution with the current instruction, running with the delay set via the slider in the first row. (Pause): Interrupts execution but retains current execution status such that, after some inspection and interaction, execution may be resumed. (Step): Just executes the current instruction and then automatically pauses before the next instruction or the end of the algorithm. 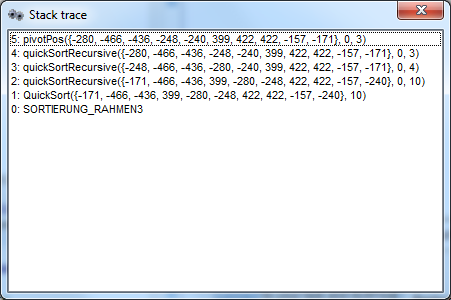 The last instruction of the algorithm has been reached and executed. A Jump element with an exit instruction has been executed. A Jump element with a return instruction has been executed and the currently executed diagram is at top level. The Stop button has been pressed. A syntax or execution error has occurred. Execution was carried out with the Step button. The Pause or Step button was pressed during execution. A breakpoint (see below) is reached. An input instruction is executed and the user pressed the "Cancel" button in the popped-up input dialog. An output instruction is executed (unless output mode is "output to window") and the user pressed the "Pause" button in the popped-up display dialog. 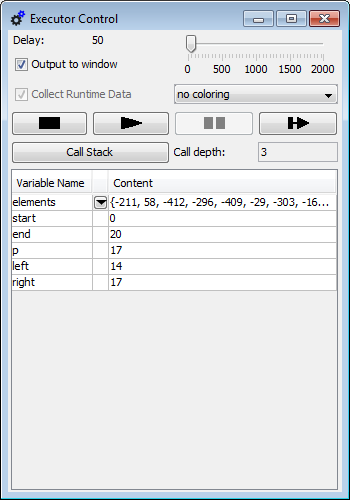 Some activities (like Call Stack display) are only enabled in paused state. You resume execution via the Run or Step button. With the slider in the top row you may control the execution delay between the instructions (for better observation). Whereas the mouse handling is rather rough, you may use cursor keys (left / right) for fine-tuning the delay value by steps of 1 while the slider is selected. If you reduce the delay to 0 then some displayed information (like variable values, execution counts etc.) will not be updated unless you press the "Pause" button or the algorithm reaches the paused state due to one of the other events described above. 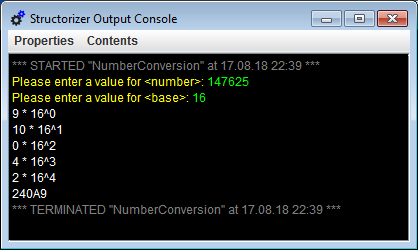 The second row provides a checkbox "Output to window" allowing you to specify how output instructions are presented: If the checkbox is not selected then output instructions will pop up a message box showing the output value and having to be quit each time in order to resume, otherwise a console-like text window (see section "Output Console Window" below) will permanently be open into which all output will be written without pausing or waiting. Since the output is always logged to that console window (even while it is not visible), it is even possible to inspect the entire output history of the program execution by selecting the checkbox after having executed the algorithm in the traditional mode (checkbox not selected). You may possibly have to open the Executor Control again to do so, because it usually closes after execution has terminated and closes the Console window. 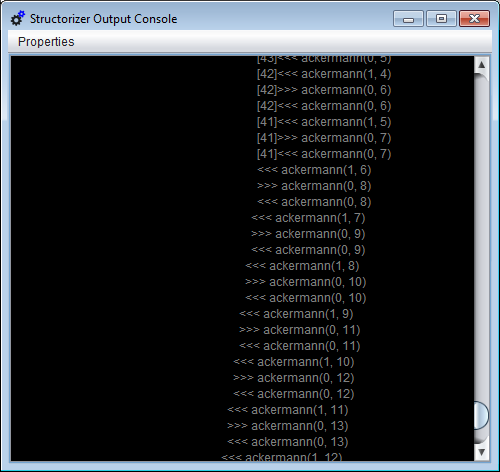 Some examples are given in the section "Output Console Window" further below. 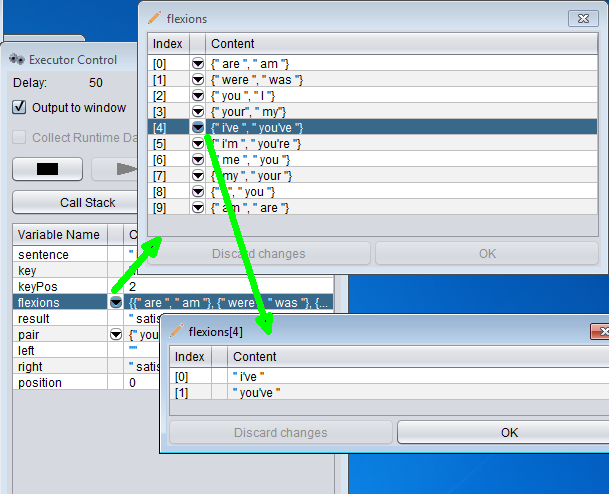 The third row provides a checkbox and a visualisation mode choicelist for Runtime Analysis. The checkbox on the left-hand side enables the tracking mode, the choicelist modifies the kind of element highlighting in dependency of the purpose of the analysis. The controls are partially disabled while execution is ongoing. See the Runtime Analysis page for details. The fifth row shows you the current subroutine call level on the right-hand side: Every Call instruction, which the execution dived into, increments the subroutine level by one, on returning from a called subroutine (and thus leaving the pending Call element) the subroutine level is decremented. The top level (program level) is 0. Note that built-in functions or procedures do not affect the displayed subroutine level; only called Nassi-Shneiderman diagrams have an impact. In paused execution state, a click on the "Call Stack" button will pop up a scrollable list view showing the current content of the call stack (see section "Call Stack" below). The lower region of the control panel is occupied by the variable display. As soon as a new variable is introduced, a new line will be added with the variable name in the left column and a string representation of its current value in the right column. In lines with a composed value (i.e. an array or record) the central column will show a pulldown button. If the inspected value was a constant then you will not be able to apply changes, the icon will be a magnifying glass instead of a pencil, and there is only an "OK" button instead of a "Discard" and a "Commit"/"OK" button. When you resume the execution, the algorithm will continue with the modified value(s). Note that the Start and Step buttons will be locked until you finish or discard editing (by <Enter> or <Esc> or by clicking elsewhere). 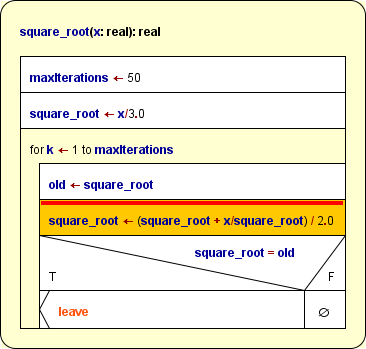 The currently executed or paused instruction is highlighted with an amber background. Compound elements with pending execution, i.e. nested components of which being currently executed (or paused), are highlighted in a cream tinge. So you may easily follow the execution progress (see image in next section). Within Parallel elements, those parts of the threads that have already been passed are also marked with the cream tinge; because of the randomly leaping execution you would otherwise hardly be able to tell how far the different threads may have proceeded. Additionally, in Runtime Analysis mode, elements already passed by one of a series of performed test executions can be highlighted in bright green to visualize test coverage. Alternatively, elements may be highlighted in a spectral colour range depending on their relative execution count or the number of involved "atomic" operations. This colouring is lower prioritized than the above mentioned highlighting for the current execution status (currently executed element and structured elements with pending execution completion). The speed of the animation is controlled by the delay slider in a range between 0 and 2000. The default is 50. You may place breakpoints on as many elements of your diagram as you like. Execution will pause as soon as an element with breakpoint is reached (for possible actions in paused state see above). To set or remove a breakpoint select the respective element and now either right-click and select/unselect menu item " Toggle breakpoint" in either the "Debug" or context menu or double-click and select/unselect the checkbox "Breakpoint" at the bottom of the element editor. Alternatively, you may press accelerator key <Ctrl><Shift><B>. If you place a breakpoint on a loop (For, While, Repeat) then the execution will pause every time the loop condition is going to be checked again. Note that you can't place a breakpoint on an Endless loop (since it hasn't got any means of control). You may place a breakpoint on the first element of its body instead. A trigger value of 0 specifies an unconditioned breakpoint as described before. 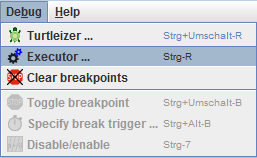 Wenn you toggle off the breakpoint then its trigger value won't get lost but is preserved for later re-activation. To eliminate the breakpoints all over a diagram at once press the speed button in the toolbar or the respective menu item "Clear breakpoints" in the "Debug" menu. Note: Breakpoints are not saved to file. Nor are setting, modifying, or removing a breakoint actions inducing an entry in the undo or redo stack. However, any undoable (substantial) change to a diagram will be associated with a snapshot of all currently set breakpoints, such that on undoing a previous diagram modification the former breakpoint status would be restored. The same holds on redoing undone modifications. As mentioned in section Executor Control above, you will open a text window logging all done output and input if you select the "Output to window" checkbox. While unchecked, the window is just hidden but still exists and gathers the texts printed during execution in the background. On starting execution, any previous content is deleted, an automatically generated line names the executed program (or top-level routine) and shows the starting time. Conversely, on terminating an execution a similar line with the termination time will be displayed (see image above). With checkbox "Output to window" not being selected, the window will just stay hidden while output instructions will pop up message boxes in the traditional way. 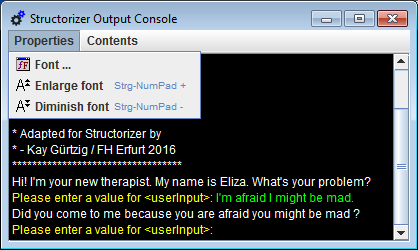 With "Output to window" selected, you actually suppress the output message boxes and bring the logging window to display. With an algorithm generating a lot of output, this mode will significantly accelerate the execution and relieve you from the necessity to confirm every single output. You may change the output option at any time during or after an execution without losing the window content. It can be reactivated by unselecting and re-selecting the "Output to window" checkbox. Closing the output window will not destroy its content. Execution errors will also be logged in red colour to the output text window after having popped up as error message box. See an example in section "Custom subroutines" above. Of course you may always select a subsection of the window content (or the entire log via <Ctrl><A>) and then copy and paste it to some text editor for example. 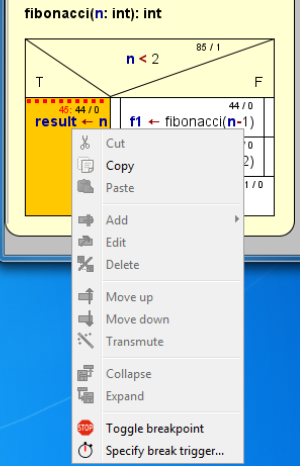 With very huge logs this might fail, however; not only for these cases there is a menu item "Save log ..." now in the "Contents" menu, which allows you to save the current window content to a text file of your choice. As mentioned in section Executor Control above, you may display the call stack (makes only sense with diagrams containing - possibly nested - CALLs, of course). 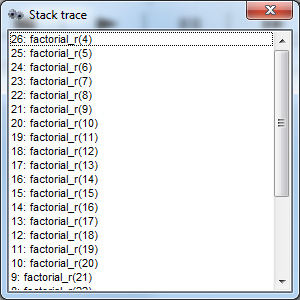 By clicking the button "Call Stack" you open the stack trace window. To dispaly a call stack requires a begun execution (of a diagram containing CALL elements) being currently paused (e.g. by pause button or breakpoint or in step mode).